MECON Notification is out. 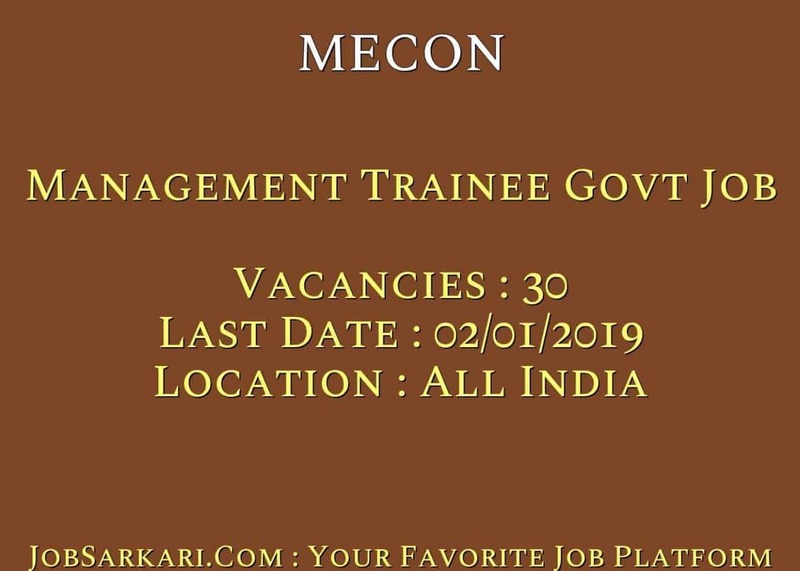 MECON is recruiting for 30 Management Trainee Govt Job Posts. You can check MECON - Metallurgical and Engineering Consultants (India) Limited last date, download MECON notification, visit MECON official website and check other MECON Vacancy details.Complete Vacancy and recruitment Details about 30 Management Trainee Govt Job vacancies in MECON are provided below by JobSarkari.Com only for you. Last Date for Apply Online 02/01/2019. Name of the Bank - Bank of Baroda, Lalpur Ranchi Branch. IFCS Code - BARB0LALRAN (5th Character is zero). Beneficiary Name - MECON Limited (Current Account). MT (T) Candidate Must Have Passed Engineering Degree in Civil / Architecture / Mechanical / Electrical / Instrumentation / Metallurgy / Mining / Computer Science. 25. MT(CS) Candidate Must Have Passed PG Degree / Diploma / MBA / MSW / MA With Specialization in HRM / Personnel Management / IR / Labour Management / Organizational Development / HRD/ Labour Welfare. 02. MT(CS) Candidate Must Have Passed MBA / PGDM/ PGDBM in Marketing. 02. MT (CS) Candidate Must Have Passed PG Degree / Diploma in Journalism & Communication / Journalism & Mass Communication / Communication / Journalism / Mass Communication / Broadcast Journalism / Media Communication / Public Relations. 01. Total No of Post 30. 5.Online Application Can be Submitted on or Before 02nd January 2019. Q. What is the Last Date For MECON Management Trainee Govt Job Vacancy ? A. 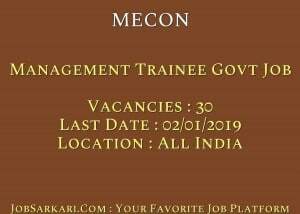 Last Date for MECON Management Trainee Govt Job Posts is 02/01/2019. Q. What is the Form Type of MECON Management Trainee Govt Job Recruitment ? A. The Form Type for MECON Management Trainee Govt Job Posts is Online. Q. How many vacancies are available in Metallurgical and Engineering Consultants (India) Limited Management Trainee Govt Job Posts ? A. There are about 30 Vacancies in Metallurgical and Engineering Consultants (India) Limited Management Trainee Govt Job Posts. Q. What is the Full Form of MECON ? A. Full Form of MECON is Metallurgical and Engineering Consultants (India) Limited .